Boaz and Irit Albert are residents of Yitzhar, in Samaria. They own a vineyard, where they produce high quality wine. 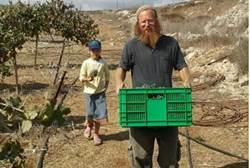 They received an order to vacate their home just when the grapes need to be picked. Israel allows Arab members of the Knesset to speak treason openly and consort with terrorist groups, but they use illegal and sham legal ways to try to prevent loyal citizens who serve in the army and work to reclaim the land from hundreds of years of neglect from urging that Israel reclaim Biblical Israel, not give it away. As Irit Albert said, "Seven years ago, my husband received an order along with other residents  also without a reason. Last time, we went to court, we filed a High Court motion, but we felt that it was all a sham from the outset and that there is nothing left to do. It turns out that if there is an order from a general, no one dares overrule it. So now we refuse to take part in the sham. We are violating the order even if it means going to jail. It is clear to us that we must not respect the order. This is the most busy time of the year in the vineyard. Disconnecting a person from his wife, children and sustenance without a reason, especially at a time like this, is a terrible injustice.". As Yizchak Shadmi, head of the Binyamin Residents' Council, points out, while Jews in Samaria and Judea receive distancing orders without trial, "They wouldn't dare to do something like that to Arabs without bringing evidence and presenting it to a judge." Irit Albert, wife of Yitzhar resident Boaz Albert who was arrested for ignoring a restraining order distancing him from Judea and Samaria, described her husband's arrest in an interview with Arutz Sheva on Thursday evening. Albert provided a chilling description of the arrest, saying that the officers repeatedly used a taser gun on her husband, even as he yelled out in pain. "We knew that Boaz would be arrested eventually and were prepared for this, but I have no words to describe the brutality of the police during the arrest," she said. As the officers broke into the Alberts' home, she said, "Boaz ran to one of the rooms and lay down on the floor. I could hear his cries of pain as he was repeatedly shocked by the police since he refused to leave the house on his own." Irit Albert said that even when the officers forcefully removed Boaz from his home, "they continued, as they dragged him towards a police car that waited in a nearby Arab village, to shock him again and again. It was dark but occasionally we could hear another scream and another scream and police yelling, 'If you do not get up we will electrify you again.'" Albert, 40, a father of six, said that he was being expelled because of pure vindictiveness, after he had spoken out in public and written articles against the IDF's policies vis-a-vis the resurgent Arab terrorism. Irit told Arutz Sheva earlier this week that the couple has no idea why the order was issued. "Other than the words 'resolute security considerations,' the order contains no explanation," she said. "It is all classified material, for security reasons. No one knows. The judge doesn't know, the prosecutor doesn't know, it's all classified. No resident in the country can be distanced without providing a reason, only we residents of Judea and Samaria." The Women in Green grassroots Zionist organization strongly condemned Albert's arrest, which it described as "scandalous". "Women in Green strongly condemn the scandalous arrest of Boaz Albert, a resident of Yitzhar, a father of six, who was arrested last night in a violent military operation in which security forces shot him and his brother with iron arrows from a taser gun and wounded him," the organization said in a statement. "All this because of Albert's 'crime' of refusing to obey to the immoral and anti-democratic edict of expulsion that was given out to him. These expulsion orders are used solely against Jewish residents of Judea and Samaria and not against Arab stone-throwers nor against the European anarchists that attack soldiers. "We call upon the Land of Israel Knesset members to intervene immediately for the release of Boaz and to enable him, after medical treatment, to go back to his family at his home in Yitzhar." "From the security forces we expect to stop harassing Jews and start to address what is expected of them: to protect the citizens of Israel against Arab terrorists, among them the terrorist murderers who, to our horror and shame, were released just two days ago." The Shomron Residents' Committee, commenting on Albert's arrest, expressed on Thursday its full support for Albert. "Issuing administrative orders against residents of Judea and Samaria is crossing a red line," said the head of the committee, Benny Katzover. "The use of administrative restraining orders against Israeli citizens is despicable and we support Boaz over his resistance and appreciate his courage over his readiness to pay a heavy price in this war." MK Orit Struk (Bayit Yehudi) called on the police to release Albert. "I call to release Boaz Albert whose only crime was his refusal to obey an undemocratic and immoral exile order," she said. "The order's sole purpose was to silence. Even the head of a crime family does not receive such an order. The only people who receive this kind of a warrant are settlers, whom law enforcement officers consider second class citizens." On September 2, 2013, Arutz-Sheva published this translation of a "powerful and though-provoking letter, written by Boaz Albert prior to his violent arrest." Not only does the injustice motivate me to fight, but also the ability to say that I am here in Yitzhar, in the hills of Shomron, gives me strength. Not for the sake of the state but due to the fact that I am a part of the Jewish nation and this is its land. About a month ago the police gave me a "special monitoring order"- an administrative order that forbids me to be in the area of Judea and Samaria for six months. The order was signed by the area's IDF Central Commander, Nitzan Alon. The order, as is customary for administrative orders, does not describe the circumstances surrounding its issuance except for the vague explanation of "security reasons." When I received the order, I declared that I did not intend to honor it. I stayed in my house and was arrested, but quickly released when it was pointed out that there was a technical mistake on the date of the order. Therefore I received a new, corrected order. It is my desire to explain what drives me in this struggle and focus on two points: the injustice of the order and the misconception of why we are here in the Land of Israel. I'd like to provide some background for those who are not well versed in the differences between the ordinary criminal justice system and the Civil Administratiom system, which is in force in Judea and Samaria. The State of Israel is a country of enlightened laws which protect the rights of the individual, including the rights of a suspected criminal. The fundamental principle of the law is that a person is "innocent until proven guilty," and this is even in the extreme case that the person admits to the charges against him or when the crime was photographed and publicized. So long as the legal process against him has not ended, the person is only a "suspect." I do not identify with the system of law in Israel. Jews desiring to be loyal to the Torah have a unique, completely different, 'criminal procedure.' As written in Choshen Mishpat, in the laws of judges, 'anyone who turns to the courts of the Gentiles is wicked and it is as if he cursed and raised his hand against our teacher Moses' (Choshen Mishpat, Siman 26, se'if 1). Nevertheless, there is the understanding that "the law of the land is the law." As long as we have not merited having rule according to the laws of the Torah, there must be a legal system for thieves and murderers which acts under the principles of justice and equality and allows us to move around safely without fear of violent criminals. Please note that what I write further on is in accordance with the proponents of the law that exists today. In order to punish a citizen of Israel for a crime, the prosecution must pass each of three hurdles where the suspect/accused/convict is entitled to defend himself with all the tools available. In the beginning, the accused is called into the police station and the suspicions are explained to him. At this stage the suspect is entitled to refute the allegations and prove his innocence. Only if the police were not convinced by his explanation do criminal proceedings begin. The next stage is the trial where all the evidence against a person is presented before him. He and his lawyer are able to contradict each and every piece of evidence or provide proof that there is still doubt and thereby prove the innocence of the accused. Only if after a process lasting many months, the court is convinced in the person's guilt beyond all reasonable doubt is the defendant convicted. Yet still the process is not complete. In the next stage, the convicted person is entitled to argue over the sentencing. Usually there is a significant difference between the state's desired sentence and the court's final decision (certainly in the case of a plea bargain). And still, we have not mentioned the right of appeal and other rights. Now we will enter another world entirely. What is an administrative order, the proceeding that prevails in the IDF Civil Government of Judea and Samaria, which are not subject to Israeli law? The IDF Central Command has the power to arbitrarily issue an order that restricts the freedom of movement of a person in Judea and Samaria without giving any explanation. The person against whom the order has been issued does not know what he is suspected of and therefore cannot deny the allegations against him. In theory, there is the right to an appeal, but in truth it is a rubber stamp. This is because the president of the "Military Court of Appeals" (this is the body to which the appeal is brought) is an officer with the rank of Colonel and there is no way he would contradict the decision of a general who is two levels higher than he (and this is assuming the president of the court is hearing the appeal and not a lower junior officer). Further, the appeal has little effect when the appealing side has no idea what it is appealing and does not relate to the specific accusations. There is logic in giving power to the general to issue such orders. Many times there is information against terrorist organizations that the Shabak (ISA) cannot present in court by bringing witnesses or other admissible evidence. Conversely, anything not dealing with such organizations and which does not relate to buses exploding in Israeli cities does not require any measures beyond the ordinary criminal procedure. We will return to my case. Using procedures which are special for murderers and terrorists against Jews who are accused of "public disturbance" or trivial property offenses is moral corruption. However, in my case it is clear that I am not even suspected of such minor offenses. As I have explained, I don't know what the suspicions are against me and no one has been able to explain it to me. I can only guess what the "the secret information" against me is and the most threatening thing I have done is write my opinions freely in articles in Hakol Hayehudi publications and in various other public forums. In my case the order involves expelling a family with six children from its house, finding a new apartment, enrolling the children in different schools and finding an alternative source of income. Perhaps the worst damage is the distancing from our circle of friends and natural environment. On top of this, I am a farmer and have to deal with my vineyard which I work on every year. And now, a few weeks before the harvest, I am to be cut off from my fields? I think that anyone who has some sense of justice and honesty should rise up against this arbitrariness where anyone who upsets the system is immediately punished with no explanation and has no ability to defend himself if he lives in Judea and Samaria. This is unlike any principles of criminal law in Israel. This is not the struggle of the people of Yitzhar, not even of the settlement enterprise - this is the struggle against a basic injustice. If there are suspicions, then with all due respect, present them and I will deal with them in the accepted manner. In my humble opinion, the root of the matter is in the fundamental question "in whose name are we here?" The security establishment relates to communities in Judea and Samaria as a kind of experiment and to the Jewish presence here as a privilege. Someday, in the eyes of the security establishment, the government will make a political decision about the future of this area and until then, you are entitled to the benefit of the doubt. Further, they grant this privliege on condition that you behave well. Or in other words it is "settlers" vs. "locals." Recently, the Shomron Brigade commander issued a particularly detailed document which refers to the Arabs of the region as the "local residents." I see the matter differently. I am here in Yitzhar among the hills of the Shomron, not for the reasons of the State of Israel rather because I am a part of the Jewish Nation and this is its portion of land [on earth]. For twenty years the state has supported and encouraged the settlement movement and there is no doubt that we must be very grateful and not disparage the help we have received. But all of this has been the goodwill of the state, not because we are committed to this land (in fact, the state does not see itself as committed to this land). Now that the State has decided to fight the settlement movement, it is clear that the only chance of the movement continuing is through explaining that we live here for reasons that predate the State and the Arabs. The Arabs are actually foreign invaders whose place is not here, and I have not a shadow of doubt that one day they will not be here. It will happen sooner or later, with consent or without, I have no idea how, but it will happen. Gush Katif was destroyed because her residents were not able to openly and clearly say, "if the State wants to send its soldiers, fine. We stay here." The people of Gush Katif, some of whom are my closest friends and family, connected their fate with the fate of the State without any conditions and therefore they were thrown out to live in mobile homes. Therefore, not only does the injustice cause me to enter this fight; rather, or perhaps mainly, I fight to make it clear that the Central Command does not have the authority to decide whether I can live here or not. I am here in the name of the Jewish Nation and the commander is attempting to establish facts in the name of the civil administration of the State of Israel. We are simply talking on different levels. He wants to help develop our communities by providing extra security? Wonderful! He wants to harm and disturb all of the above? I am not here because of his generous consent. Administrative expulsion orders inherently include a permit to stay in one of the communities of Judea and Samaria, in my case it is in the community of Shaarei Tikvah. This is not due to generosity from the Central Command, it is a legal necessity. The Geneva Convention provides a prohibition forbidding the commander of an occupied area to expel a resident outside the occupied area. However, the commander is permitted to demarcate a certain area where a person is allowed to be. Therefore Nitzan Alon is following the rule, he is not expelling me, G-d forbid, from Judea and Samaria, he is confining me within Shaarei Tikvah. How will all this end? I don't know. I am certain of the justice of my side in the matter and with G-d's help it will all turn out for the best.